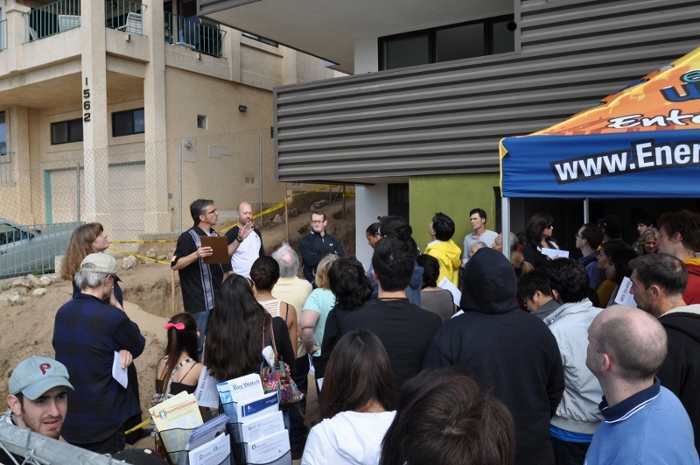 Robert Fortunato and sustainable construction professional Wes Harding address the over capacity crowds assembled for the construction tours of the Green Idea House. 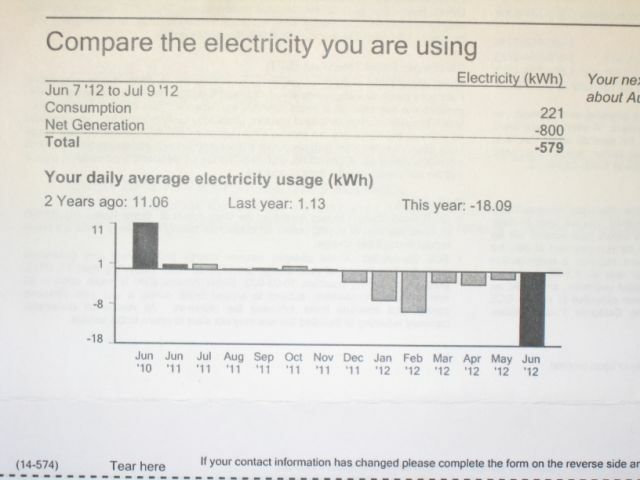 The Fortunato's electricity bill showing the plummeting usage from 2010 before the retrofit to 2012 after the retrofit. 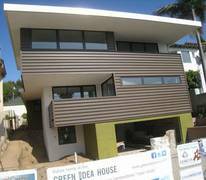 The Green Idea House is a simple and replicable – yet cost effective – case study in creating a ‘net zero energy and zero carbon’ home in Coastal California and similar regions. Net zero energy means that the house will annually produce as much energy as it consumes, and zero carbon means that the house will not produce any carbon emissions. This approach accelerates progress toward the California Public Utilities Commission’s goal that “All new residential construction in California will be zero net energy by 2020.” The local investor owned utility Southern California Edison chose it as the cornerstone case study to facilitate the transformation of residential construction to net zero energy by 2020, studying a real project on a constrained lot being undertaken by motivated residents with a limited budget. When the Fortunato family needed to expand and remodel their modest home on a small city lot, the prospect of building green was daunting and the learning curve steep. As a result, they felt compelled to share what they were learning and create a community around the idea that anyone should be able to build affordably, sustainably, and with energy efficiency in mind. The process of designing, constructing and showcasing this project created a robust collaborative involving private, public and non-profit organizations. The Fortunatos used this team, as well as their own passionate persistence and curiosity, to identify and utilize materials that had the lowest lifecycle ecological impact, while still being affordable and readily available. The final outcome was a remodel that, at $200/square foot (before factoring in federal and state incentives for solar panels and efficiency upgrades), cost below average for the area, reduced the home's energy load by 80%, and created a house that, to date, makes more power than it uses. The Fortunatos plan to use the excess power in the future to charge electric vehicles., which they intend to purchase to replace their gas powered cars. 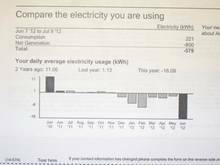 The return on investment for the 6.5 kilowatts of solar panels, one of the most expensive elements of the retrofit, is approximately 8 years. The home is also healthy, as the Fortunato family made sure to eliminate VOC's, outside pollutants, and other toxins wherever possible. The Green Idea House has attracted thousands of visitors wanting to learn about the Fortunato's innovative project and how they achieved it. The effort helped inspire the local City of Hermosa Beach to pursue a Carbon Neutral plan, for which the city has received state funding for a feasibility study. 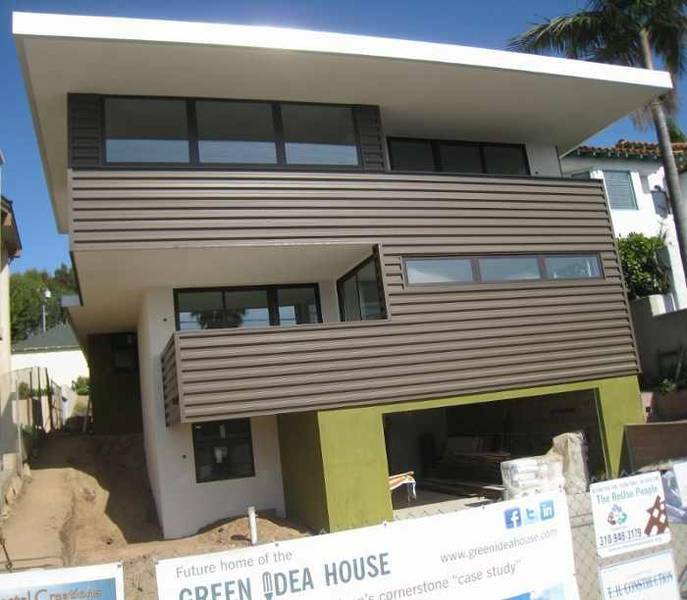 • As a result, the Green Idea House won Los Angeles County’s 2012 Green Leadership Award.